You are not logged in. [Log In] BackcountryForum.com » Forums » BACKCOUNTRY TOPICS » General Discussion » Packing heat...how do you carry your pistol? #202520 - 01/27/19 11:28 PM Packing heat...how do you carry your pistol? I'm going to hike Lake Clark National Park in Alaska in August of this year and plan to bring my Kimber Aegis Elite .45 with me for protection from the critters. I've never carried while backpacking before and I'm curious how ya'll carry yours? I thought about wearing something like this leather holster but not sure it'll work/feel decent with the pack straps. But it would definitely be easily accessible. I think most of us on these boards lean towards leaving any arms at home. Unless you are a highly trained crack shot, a pistol is not much use against a bear. Bear spray is considered more effective, and it weighs less, too. Unless you are such a good shot that you can hit a rapidly charging bear in a vital spot every time, stick with the bear spray. Hell hath no fury like a wounded bear! In addition, check the park rules on firearms You can possess firearms, if eligible under Federal and Alaska law, but you may not shoot! "Under federal law, the use or discharge of a firearm is still prohibited by applicable provisions of 36 CFR Section 2.4(a)(2)(ii) and 36 CFR Section 13.30." Bear spray has been shown to be far more effective. There are references in this article. I don't consider a .45 ACP adequate protection in bear country. I may carry a pistol while hunting, but only when it's legal to hunt with that pistol. Whether armed, or not, I would still rely on Bear Spray as my first defense. 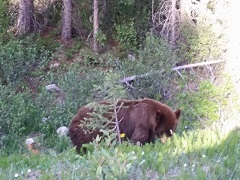 There are some places where bear spray is not allowed, so I would check on that, too. I ultralight so carrying a gun isnt that bad. Only when I am in grizzly country do i carry a gun and when I do I carry, I carry a Marlen 450 guide series with a 500 grain round. Again the big question is can i pull it out in time. I dont know. I've tried a generic pouch holster (that looks like just a pouch) for my security 6, but didn't like it. I'm going to try a hill people gear chest rig this summer.